Pettit Marine Paint has launched the latest product in their ablative Hydrocoat lineup, Hydrocoat Eco, which is already shattering the perceptions of what an antifouling paint can be. 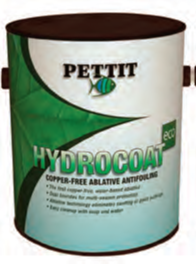 Hydrocoat Eco incorporates Pettit’s exclusive self-polishing, water-based, ablative technology with an organic biocide, Econea. Hydrocoat Eco can be applied with a brush, roller or spray, and cleanup is done with soap and water. The self-polishing paint film wears away with use, eliminating paint build up and the need for sanding. black, and is offered in quarts and gallons. For more information, visit pettitpaint.com.